"What is needed, rather than running away or controlling or suppressing or any other resistance, is understanding fear; that means, watch it, learn about it, come directly into contact with it. We are to learn about fear, not how to escape from it." To know about the listed products , drop a message in the comments section. 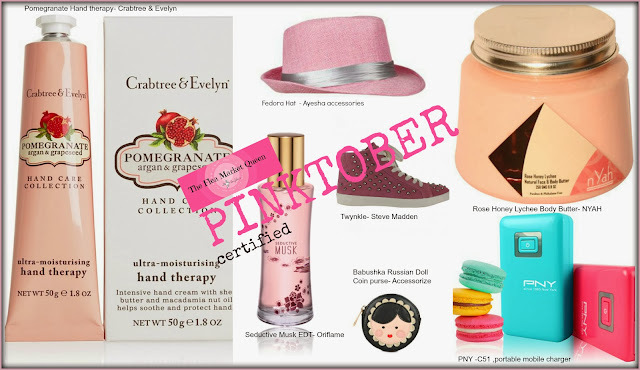 Its pink, its beautiful, its October-celebrated as Breast Cancer awareness month . It is not very easy to let grave topics like these create interest without some form of attraction. No pun intended. I mean why pink? The pink ribbon, the pink merchandise all over the world, just so that some buzz is created. However, it doesn't mean we get too swayed away by shopping all that looks pink and do nothing about the actual campaign! So what do we know about Breast Cancer? Why do you think this awareness campaign can help?
" Just like every woman is different, her breasts are different too.No one can know it better than she herself, not even the doctor. Hence its important to do self examination at periodic intervals. Follow these 5 steps to examine your breasts at home and once you cross 30 start having mammograms once every year. 1. Underwire Bra increases risk of cancer: FALSE : Clothing has no connection to breast cancer! 2. My breast always feels lumpy, does it indicate breast cancer? Not necessarily. The breast is made up of fatty tissues which seems to be lumpy when touched. Check the 5 steps shared above to know what is the right way to detect if the lump could be cancerous & other changes that indicate an alarm. Hard Rock Cafe is known to drive 'Pinktober' Breast Cancer Awareness campaign globally every year where it sells pink merchandise to attract; invites eminent doctors & survivors to educate and plans fun activities to keep it rolling! Another attractive feature of the Pinktober initiative includes the Pink Halloween on 31st October, where they will encourage fans to visit the café and sport the color pink. Their servers will also be seen wearing pink bandanas & ribbons to support the cause. Are you game?